Can you have too much of a good thing? Economists, buffet-goers, fans of Boston-based sports teams, and many, many others have pondered this topic, ad nauseam, since… well, good things have existed (debatably, the first good thing was "fire," of which you can certainly have too much). On my first trip to the Cheesecake Factory, the middle-class fanciest restaurant this side of Bonefish Grill, I have to admit, I was overwhelmed. I assumed the menu in front of me was a misplaced coffee table book. Or maybe instructions on how to safely store plutonium. But the 21-page, 250-item tome -- as you probably know -- is the Cheesecake Factory's standard menu. And it's not just the volume of items that's surprising: The apparently random variety of dishes that comprise the menu make it hard to peg what the Cheesecake Factory is. Taquitos live alongside edamame. You can have your chicken served with gravy and biscuits, or soaked in sweet and sour orange sauce. If you order a filet mignon, your tablemate can counter with a BBQ pizza. The menu defies definition, and circumvents any semblance of culinary consistency. It's almost as if the founder of the Cheesecake Factory decided to just put literally anything into the menu, as long as people liked it. And according to the founder of the Cheesecake Factory, that's exactly what happened. David Marshall Overton is the founder, chairman, and chief executive officer of the Cheesecake Factory -- which he started 40 years ago in Beverly Hills, California, because his mother needed a place to sell her eponymous desserts. Ironically, his original intentions for the menu revolved around simplicity. "At first, we really just wanted a menu that lived around the cheesecakes," Overton said. "I wasn't a chef, I had no experience in the restaurant business either, and I didn't want any chef we hired to walk out on me. So, I made sure that everything we served, was something I could make myself." Overton stuck to burgers, salads, and sandwiches (alongside a slew of his mother's specialty cheesecakes, of course) and took measures to ensure he could still make anything on the menu, if needed. They featured home fries instead of French fries, for example, because he had never used a deep fryer before. "We definitely had a fresh approach," he said, "but partly, that's because I didn't know what I was doing." Over time, Overton realized he had a natural talent for for cooking, as well as running a restaurant in general. 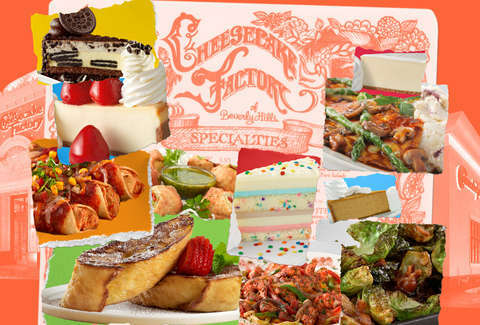 After a year of booming success running with their original menu, the Cheesecake Factory was looking to expand their offerings. "When I ate at other restaurants during this time, I was able to take some of the more complex recipes, more expensive dishes, and bring them down to casual dining," he said. "I'd work on new menu items with a cook, behind the line. And as we kept expanding the menu, people kept responding positively." Simply put: Overton and co. were throwing dishes at the wall (or more accurately, their customers) and hoping that they stuck. "At this point, after a couple years, I was thinking that I didn't want this concept to run out, and I didn't want another restaurant to open down the block and take my business away. We just kept putting things on the menu, that people seemed to like. Finally, I thought, 'Well, there's nothing that America wants that we shouldn't be able to put on the menu.' So, we just kept at it." So, as Overton put it, they "blew the menu out." They added Mexican dishes. They slotted in pastas and parms. They were down with literally anything that people could conceivably order. And it was all because they were trying to keep away any competition, from any restaurant, period. They turned into a veritable Babu's Dream Cafe, to make sure they had whatever Americans were craving at the time. "I probably should have kept the menu slimmer, if I knew then what I know today… I had no idea we would become a chain, and would have to recreate this menu dozens of times," Overton said. "We put anything we wanted to on the menu. Every June and December we added new items. And we tried to stay current, adding any food items that happened to be trending at the time, and tried to keep pace with what America wanted. Really, we're a 2018 restaurant, that started 40 years ago." The pleasures stemming from freedom of choice do present some distinct problems for the restaurant's staff. You might have heard the (admittedly wide-spread) rumor that Cheesecake Factory servers have to memorize the entire menu as part of their training process. This isn't exactly true -- but the servers do go through a two-week classroom training course, so they are well-versed in the intricacies of the menu. And while the servers are the ones taking the orders, someone in the kitchen has to be ready to cook them, right? "Every single thing that we make, we make from scratch. Every single product. It's constant hard work. We have a double management setup, with regional managers for the 'front of house,' and also managers in the kitchen, which is rare," Overton said. "And I don't think there's anyone who puts as much into training as we do. We have to. Our cooks are trained for three-to-four weeks, because they are going to have to cover such a broad menu, and make everything themselves. 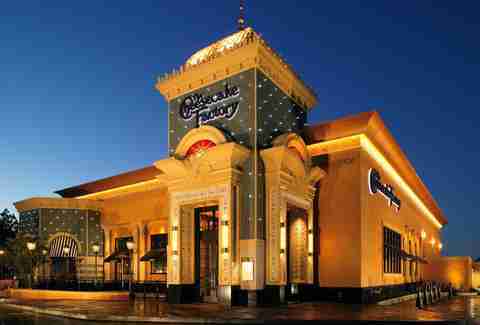 Everything is hard at the Cheesecake Factory, but that's what makes us so successful." While Overton might (slightly) regret his decision to turn the Cheesecake Factory's menu into a veritable textbook on mainstream American cuisine, he realized they might have reached their limit, last year. "I decided, we're done," he said. "The menu will stay capped at 250 items. We will certainly continue adding new dishes to the menu, but we're going to start taking things off, too. The menu is big enough as it is." On the topic of unwieldy bigness, it's also important to note the size of Cheesecake Factory's portions align with the breadth of their menu. This is another example of Overton taking a (big) swing, and following his intuition. "Growing up, my parents used to go down to Miami and gush about the large portions they commonly saw down there," Overton said. "So right away, I knew it was important for us to have large portions. Again, I didn't have restaurant experience, but it just seemed like the right thing to do for our business." Overall, the menu is littered with riffs on cultural cuisines, classic Americana, and analogues to Overton's personal favorite foods -- their Roadside Sliders, for example, are designed, from memory, to mimic a burger stand that Overton grew up frequenting. Inherently, every restaurant is defined by their menu -- and the Cheesecake Factory is no exception. The excess, the variety, and the overall scatterbrained melting pot of the menu are why people love continue to go to the Cheesecake Factory, for more than just dessert. "I'm not sure you can define what we do," Overton said. "We work incredibly hard, and we try to give people what they want, and what they love. We have something for everyone. And that's why I think we've been so successful." Everything is hard at the Cheesecake Factory (including navigating the menu). But that's probably what makes eating there so easy. That, and the Celebration Cheesecake, obviously.